Ensure the safety of the gadgets, Elung’ata direct county chiefs – Kenyatta University TV (KUTV). All Rights Reserved. 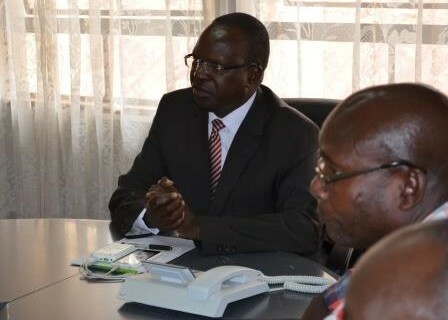 Murang’a County Commissioner (CC), John Elung’ata yesterday directed the chiefs to beef up security in schools within their areas of jurisdiction to ensure the safety of the gadgets. Elung’ata issued the orders during the launch of the programme in Gatunyu Primary School in Murang’a County, challenging chiefs through Community Policing Committee to maintain peace and order in the schools. “We don’t want to hear any case of stealing of the digital tablets issued to schools and I challenge chiefs through the Community Policing Committee (of Nyumba Kumi – Usalama Wa Kimusingi) initiative to ensure there is adequate security in all schools,” added Mr. Elung’ata. According to Elung’ata, in the past, there have been cases of stealing of textbooks in some schools saying the trend should not be shifted to the digital gadgets.